In a food processor, pulse the flour with the granulated sugar and salt to mix. Add the butter and pulse in 1-second bursts until the mixture resembles coarse meal. Drizzle the ice water on top and pulse in 1-second bursts until the dough just starts to come together. Turn the dough out onto a work surface, gather any crumbs and pat into 2 disks. Wrap the disks in plastic and refrigerate until chilled, about 45 minutes. Work with 1 disk of pastry at a time: On a lightly floured work surface, gently tap the pastry with a rolling pin to flatten it slightly. Dust lightly with flour and roll out the pastry to a 13-inch round, a scant 1/4 inch thick. Slide the pastry onto a sheet of parchment paper, then slide the paper onto a baking sheet; refrigerate until chilled. Repeat with the remaining dough (see Note). Transfer one pastry round to a 9-inch pie plate. Using your fingers, press the dough over the bottom and up the side of the plate over the rim. Using scissors, trim the overhanging dough to 1-inch. Fold the overhanging dough under itself to form a neat edge, then crimp decoratively (see Note). Repeat with the remaining pastry round to form one more crust. Refrigerate for at least 30 minutes before using. 1. 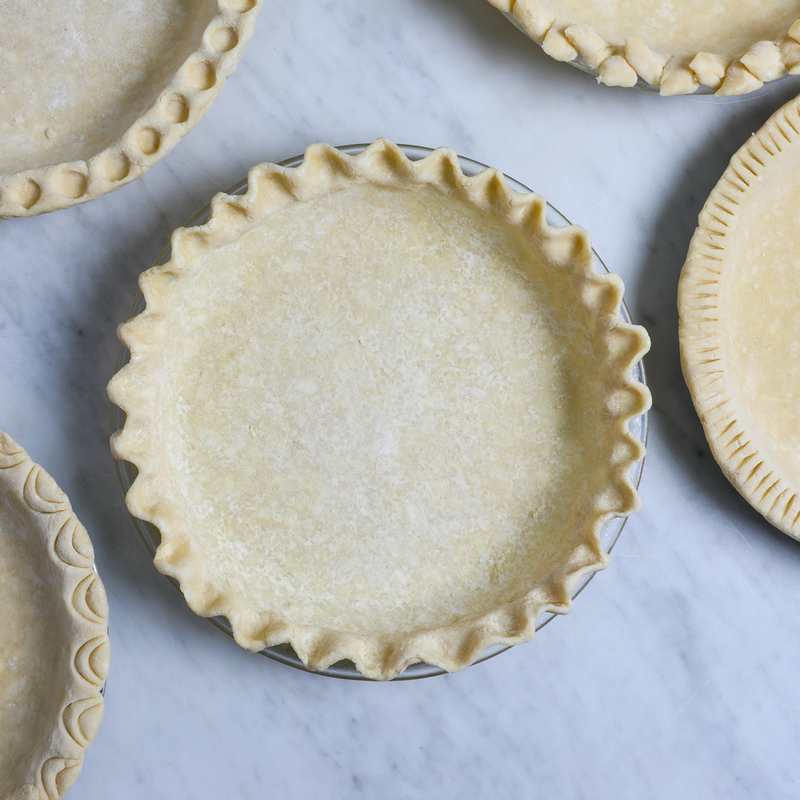 If making a double crust pie, roll out the second disk of dough to a 12-inch round and center it over the filling. Press the edges of dough together and trim the overhang to a scant 1-inch, fold the overlay under itself and crimp decoratively. Cut a few slits in the top crust for steam to escape. Classic Crimp: Use your thumbs and fingers (or knuckles) to crimp a scalloped edge. Old-School Edge: Use the tines of a fork to imprint lines in the dough. Crescent Moon: Use an inverted spoon to form crescent shapes around the edge of the crust. On the Dot: Use the handle of a thin wooden spoon to imprint the edge of the crust with dots. Caesar’s Crown: Using scissors, snip the crust of the dough in 1-inch intervals and then twist the dough in opposite directions to form what resembles Caesar’s crown.